Join or Die, the first political cartoon published in an American newspaper, illustrates Benjamin Franklin's warning to the British colonies in America "join or die" and exhorting them to unite against the French and the Natives. It shows a segmented snake, "S.C., N.C., V., M., P., N.J., N.Y., [and] N.E." The woodcut drawing pictures a divided snake in eight pieces representing as many colonial governments. The drawing was based on the popular superstition that a snake that had been cut in two would come to life if the pieces were joined before sunset. The drawing immediately caught the public's fancy and was reproduced in other newspapers. 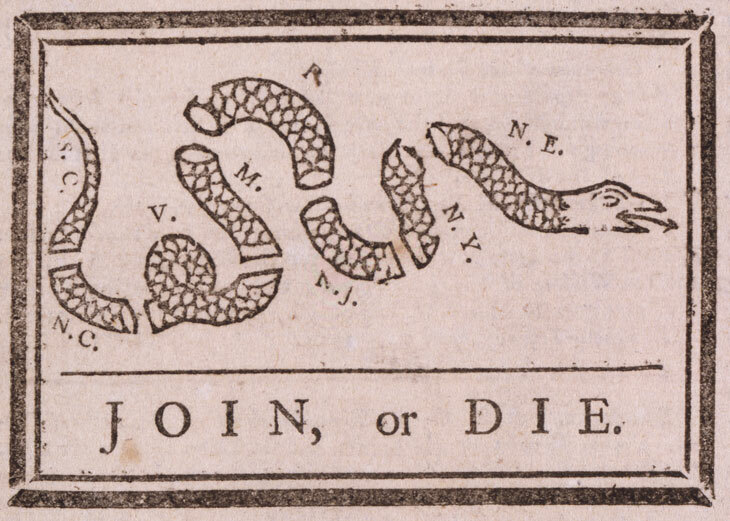 It has been suggested that the Join or Die snake is a “cartographic caricature,” or a map generalizing and exaggerating the American colonies’ most recognizable features - namely their locations and coastlines. The colonies are represented in geographic order, with the New England colonies at the head of the snake and South Carolina at its tail. The New England colonies are not listed individually and Georgia, oddly, does not appear at all. The undulations of the snake’s body broadly suggest the curves of the North American east coast. Originally, it was thought that the letter above the fourth segment of the snake was an "R." Recently, however, it was determined that the letter is a "P," representing Pennsylvania. The Library of Congress inspected the original page containing the cartoon in their copy of the Pennsylvania Gazette that was published on May 9, 1754. By looking at the woodcut under a microscope, the conservators discovered that that, "What appears to be a diagonal leg of the letter R is actually embedded in the paper; it is what papermakers call an 'inclusion' or 'shive.' A shive is a piece of papermaking fiber that was present at the time the paper was produced" (Library of Congress letter dated March 30, 2017). the Pennsylvania Gazette, May 9, 1754.